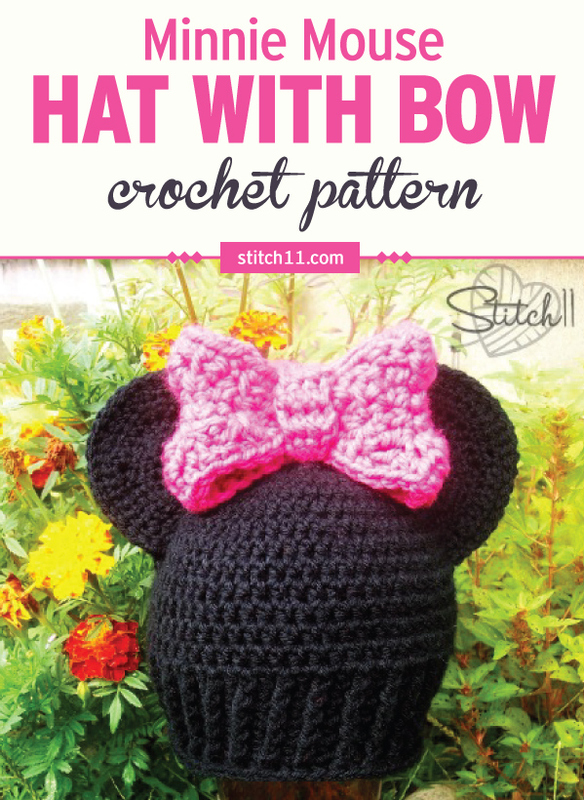 This Minnie Mouse Hat Crochet Pattern is perfect for little ones who are big fans of Miss Minnie Mouse. 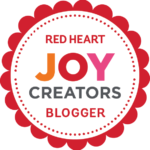 When I was first learning how to crochet, a local mom came to me while shopping in the baby food aisle at Walmart. She told me she LOVED my daughter’s hat (first and the only thing I had made at the time) She offered me 20 dollars to make her daughter a hat too! I was so shocked and excited! Now 2.5 years later, she has come back! She wanted to know if I could make her daughter a Minnie Mouse hat. How exciting is this? We will both get to see how far I have come since that first sale. And… not to mention the fact that she came back in the first place 😉 I told her I felt sorry for all the people who paid me for hats when I was first learning to crochet. She was quick to tell me they still love and admire the hat, but that her beautiful daughter has simply outgrown it. So here we go! This pattern is designed for 3-5 year olds. Finish off and repeat for a total of 4 ears. Layer 2 ears together and join from one side to the other with the slip stitch. No need to join the bottom, you will do that when attaching it. This will make it a thicker and stronger ear. Attach the ear to the hat and repeat for the other ear. I attached my ears across rounds 2-9. Now all you need to do is make your Minnie Mouse Bow and attach it in front of your ears. When I attached my bow, I used black yarn and not only attached the bottom center to the hat, but I also attached it to the ears a little bit. How would I make this larger? For a 7 year old. Thanks Harma for letting me know. It wasn’t really missing.. but the number was skipped >.< Haha! I fixed them. Thanks again. You may like the hat portion better and sizes that Repeat Crafter Me has designed. I have her’s linked in the opening of this post. It shouldn’t flare. The FPSC at the bottom of the beanie should make it thicker and stretchier just at the band. Is row 15-19 supposed to be Front Post DOUBLE Crochet or should it be Front Post Double HALF Crochet??? Row 15 through row 19 use Front Post Double Crochet and the reason you would mix it with the HDC is because the height difference from doing a Double Crochet Post stitch makes it actually the height of a Half Double Crochet stitch. I hope I make sense? I want to try to make this but the pattern doesn’t say how many to chain to make the magic circle. Thanks for your help. There is a video linked for how to make the magic circle. If you don’t know how to make the magic circle, you can chain three and join to make a circle. I’m having a tough time atraching the ears. How did you do it? the only i didn’t like about this pattern there no sl stitch till you to the end and that makes it hard to tell where my rows are ending . Yes, because of copyright laws on the Disney characters I decided to take most of my character patterns down until I know I can share them legally. As long as you don’t make it to sell I would think you’re ok. I really do hate Disney. Even if you sold it I’m sure it would be pennies for them. I hate the greediness of these big companies. Love the hat! I am wondering if I could get the pattern for the bow? Thank you! Thank you for letting me know. It is supposed to read “FPSC” Front post Single Crochet around. Oh wow! Thank you for letting me know. It is supposed to read “FPSC” Front post Single Crochet around. Thanks again for letting me know so I could correct it! How can I make this for a 16 month old? I would skip the last increase round and maybe a round or so in the length. You can check measurements online too if you aren’t sure. Or, you can use your favorite beanie pattern and come back here for the edging and ears?